During the annual Career Day colloquy at Pacific Union College, Alan Nakanishi, Assemblyperson for California’s Tenth Assembly District, reminded students that the key to success is to trust in God’s leading. “You and I serve a powerful God. If he can take a poor boy from the ghettos of Sacramento to PUC to Loma Linda to the halls of the state capital, then he can do more for you,” said Nakanishi, who was the special guest speaker at the event. 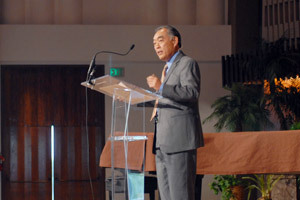 Nakanishi shared his own career journey, which started at PUC nearly fifty years ago. He had just graduated from high school and was contemplating whether he should attend the local university in Sacramento or PUC. “My family couldn’t afford for me to be at PUC. But I had a conviction that God wanted me to be at a Christian college,” he said. So at 17 years old, Nakanishi enrolled at PUC with just enough money to last one quarter and the determination to be a doctor. Nakanishi managed to stay the entire year. To earn money for college, he cleaned classrooms, bussed tables, sold books door to door, and worked as a lab instructor. Each fall, he wondered if he would be able to continue at PUC; and each fall, he managed to have enough money. In 1961, Nakanishi graduated from PUC with a bachelor’s degree in chemistry, then went onto medical school at Loma Linda University. Following a three-year residency at the USC Medical Center, he served as a major in the U.S. Army for two years, leading the surgical department at McDonald Army Hospital in Virginia. His dream of becoming a physician a successful reality, Nakanishi decided to move his career in another direction: local service. In 1998, he ran for Lodi City Council and won. Three years later he became mayor. Nakanishi was elected to represent the 10th Assembly District for the state of California in 2002. Today, reelected to a second term, he serves on multiple committees, including appropriations, education, and health. After nearly ten years in local and state politics, Nakanishi remains humble about the path his life has taken. From sweeping the halls at PUC to walking the halls of the state capital, Nakanishi attributes his incredible journey to God’s leading. “None of our lives is insignificant or wasted when led under the hand of our heavenly father,” he said.